First, the details of the latest episode of rock star Dou Wei (窦唯) versus the media (in this case, it is Beijing News). At around 10am on May 10, Dou Wei went to the office of Beijing Times. 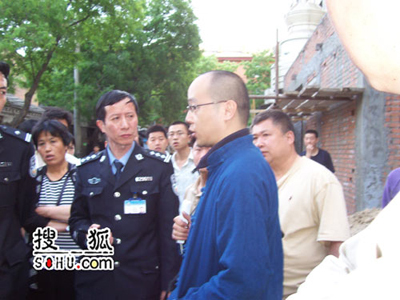 According to eyewitnesses, Dou Wei demanded to see the reporter named Zhuo Wei (卓伟) who had written several reports about him. When Zhuo did not appear, he sat quietly and waited. But after his request was not met, he smashed a television set and a computer. When a Beijing News department head came to see him, Dou Wei tossed a glass of water into the person's face. The Beijing News people contacted a couple of Dou Wei's friends and asked them to come and calm him down. Shortly after noontime, Dou Wei left with his two friends. As he was leaving, Dou Wei said that he would be back in three hours. At around 5pm, Dou Wei returned to the Beijing News office. According to eyewitnesses, he did not do anything. He just stood outside on the street, looking dispirited. At around 530pm, Dou Wei took out a mineral water bottle and poured the liquid in the bottle on the car that belonged to a Beijing News worker. Then he set the liquid on fire. The fire was put out quickly. According to eyewitnesses, there was a heavy smell of gasoline. 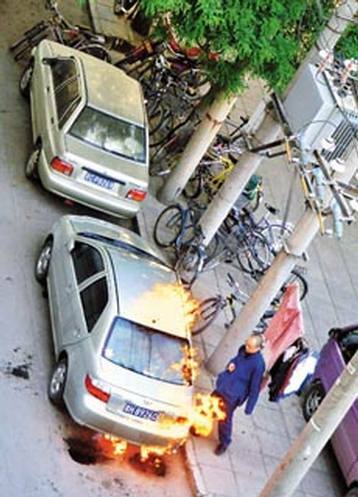 After setting the car on fire, Dou Wei did not leave the scene. Soon, three fire engines arrived at the scene. The police also arrived and they took Dou Wei back to the police station At least twenty to thirty reporters (including the various Beijing media as well as the Hong Kong reporters who waiting in Beijing for Faye Wong to deliver her baby) went over to the police station too. According to Dou Wei's lawyer, he said nothing during the police interrogation. Another person who was in the police station on some other business told the media that Dou Wei kept repeating "Someone is trying to harm me" to the policemen. 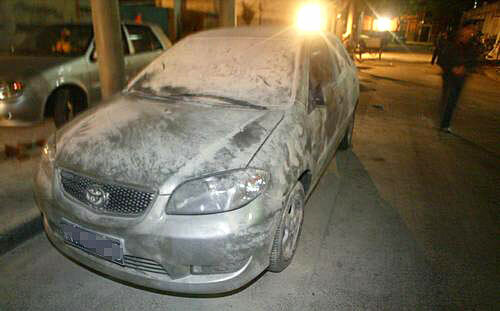 Several people from Beijing News were also questioned, including the owner of the car which was set on fire. 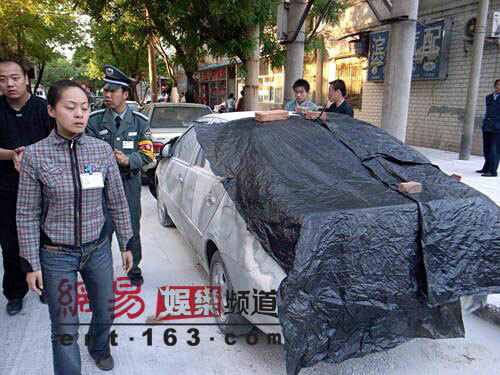 It was said that the car owner is an editor who has absolutely nothing to do with any reporting about Dou Wei. At around 4am, Dou Wei came out of the police station and left by car. This is the news report in Beijing News that was supposed to be the cause of the troubles. (Beijing News via Sina.com) Li Yapeng Goes On Full Leave To Accompany Faye Wong On Maternity; Dou Wei Denies Cursing People. By Zhuo Wei. May 10, 2006. Yesterday, according to a report in a Shenyang newspaper: Dou Wei is cursing again and this time he is cursing Li Yapeng for being a hypocrite. When this reporter called Dou Wei's telephone number, he said that he never said such a thing, and he has never been interviewed by that newspaper. Later the reporter contacted Li Yapeng's manager Ma Jia. Ma Jia denied the news report. She said that Li Yapeng will not react to this kind of news. Besides, they have not heard Dou Wei say that in person. She is a friend of Dou Wei for many years, and she does not think that Dou Wei would say anything like that. As for the matter of Dou Jingtong being bitten by a dog, Ma Jia said: "Tongtong went to a friend's place to play, and she was bitten by the friend's dog. It was a small wound and it happened more than 20 days ago. This has nothing to do with Li Yapeng caring about Tongtong or not. Who can guarantee that his child won't trip or get bumped? Tongtong is not the first child to be bitten by a dog. Actually, Li Yapeng cares and loves her all along." As for the report about Li Yapeng not caring about Faye Wong and child and leaving them to make money in Shanghai, Ma Jia rebutted: "We went to attend the event in Shanghai and we stayed over for one night. It is quite normal to go and earn money for the family. I am sure that everybody understands. Besides, we have decided that Li Yapeng will not take on any more work for the next four months at the very least. He will not be out of Beijing. He will be here with his wife to spend these most important moments of his life together." Earlier, Li Yapeng was a guest on CCTV and he said that Faye Wong will deliver their baby at home. This has caused some speculation in the media, with some media saying that Faye Wong will be delivering the baby at a first-class private hospital. As the expected date approaches, there are different sayings about where she will be delivering. Ma Jia responded: "They made up the story about Faye Wong going to deliver at some first-class private hospital. It is incomprehensible. I am only now that Faye Wong and Li Yapeng have made the preparations and it is most likely that the delivery will take place at home." Ma Jia said that there are dozens of reporters hanging outside Faye Wong's house now. Faye Wong is stuck inside. She went out a few days ago and she was mobbed by the flashbulbs. The reporters are bound to irritate Faye Wong this during the most sensitive period of her pregnancy, possibly causing premature birth. She hopes the media friends "would have mercy with their cameras." 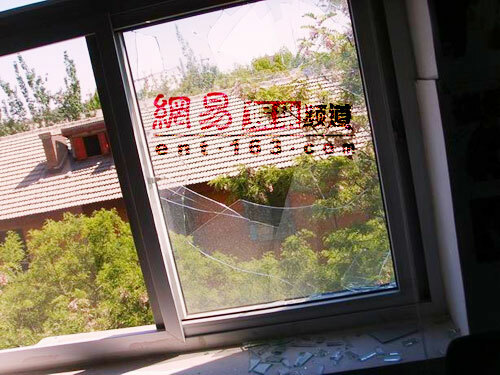 (Beijing News) Beijing News' statement about Dou Wei's overreaction at our offices. May 11, 2006. At around 10am on May 10, Mr. Dou Wei came alone to our office to complain about a report in our newspaper and the reporter. We took this seriously and the relevant reporting and legal department listened to Mr. Dou Wei's opinion. As Mr. Dou Wei was emotionally upset, our newspaper's responsible people spent more than two hours to try to convince Mr. Dou Wei that we will be seriously investigate the matter and contact him about the results in a timely manner. 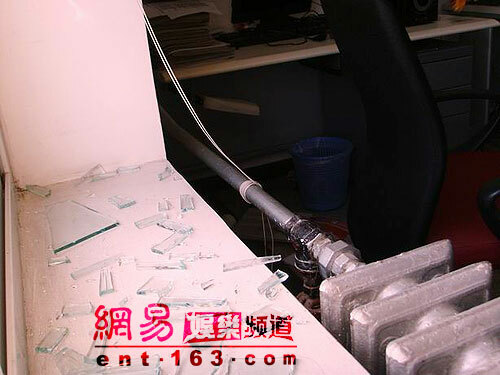 During this process, Mr. Dou Wei could not hold his emotions down and he wrecked some office equipment and poured water on the workers, thus disrupting the normal operations in the office. Since we were not able to communicate, our workers contacted two friends of Mr. Dou Wei and asked them to come to the office to talk to him. Dou Wei then left with his two friends. Our newspaper then made a detailed investigation of the two reports that made Mr. Dou Wei happy. After verification, the "Ding Wu recommends Dou Wei should see a psychiatrist" on page C03 on April 5th and "Dou Wei denies cursing Li Yapeng for being a hypocrite; Li Yapeng Goes On Full Leave To Accompany Faye Wong On Maternity" on page C08 on May 10 were reports that was based upon interviewing Dou Wei himself, Yang Ting, Ma Jia and other principals. The objective facts were correct, the language was tight and careful and the intention was amiable. There is no damage to the interests of the principals. As everybody knows, our newspaper has followed the journalistic principle of serious, objective and responsible reporting since our founding. We do so in entertainment reporting as well, and we draw our lines apart from tendencies of low-taste. With the field of rock 'n roll music which has often been neglected by the media, our newspaper have made a lot of formidable reports and special features. Our newspaper has also given Dou Wei himself a high opinion and assessment, including a number of positive reports such as those on December 17, 2004; April 7, 2006, April 26, 2006 and so on. Our friendliness and respect towards rock 'n roll in China as well as Dou Wei can be readily seen. When Dou Wei reflected his opinion to us, we were friendly and restrained and we hope to use our good will to relieve Mr. Dou Wei's discontent. Our newspaper deeply regrets this outcome. We reserve the right to pursue legal responsibility for the disruption and property damage that he caused to our newspaper. ... Afterwards, Beijing News issued a statement. In my view, this statement was shameful. First, it avoided the issues. Concerning the report and the reporter which upset Dou Wei, Beijing News "stated" quite unclearly: "After verification, the 'Ding Wu recommends Dou Wei should see a psychiatrist' on page C03 on April 5th and 'Dou Wei denies cursing Li Yapeng for being a hypocrite; Li Yapeng Goes On Full Leave To Accompany Faye Wong On Maternity' on page C08 on May 10 were reports that was based upon interviewing Dou Wei himself, Yang Ting, Ma Jia and other principals. The objective facts were correct, the language was tight and careful and the intention was amiable. There was no damage to the interests of the principals." This was a conclusion without any evidence. How did they verify it? What is the content and process of verification? Beijing News said nary a word. Just a verdict sheet in the form of a statement made in a stiff tone. Previously, the media said that Dou Wei went to Beijing News for a serious discussion and had no intention of overreacting. But when he got there, the newspaper refused to let him meet with the reporter who wrote that article. "Dou Wei was stalled for several hours and that got him mad." I noticed that Dou Wei was looking for Beijing News reporter Zhuo Wei. On March 21, that person had the guts to get on CCTV's "True Words" program to proclaim: "Entertainment news is trying to restore the truthfulness of news, but it isn't always true!" (link) That was the same Zhuo Wei. According to a former Beijing News entertainment reporter: one time, actor Chen Jianbin called up Zhuo Wei because he was angry about a report of romance with Jiang Qinqin: "I always thought that Beijing News was a responsible and serious newspaper, so how can you be writing about this kind of stuff?" Mr. Zhuo dared to reply: "You are wrong about that -- unless you are not responsible and serious in your romance with Ms. Jiang Qinqin?" In the Dou Wei incident, Beijing News ignored even the most basic process of justice and used the media organ to pronounce a judgment. They unilaterally proclaimed that they were "innocent" and "victorious." At a minimum, this is like a thief who acts as the judge as well. Next, the Beijing News statement was obviously misleading the public and groveling for public sympathy. Beijing News said in the statement: "As everybody knows, our newspaper has followed the journalistic principle of serious, objective and responsible reporting since our founding. We do so in entertainment reporting as well, and we draw our lines apart from tendencies of low-taste. With the field of rock 'n roll music which has often been neglected by the media, our newspaper have made a lot of formidable reports and special features. Our newspaper has also given Dou Wei himself a high opinion and assessment, including a number of positive reports such as those on December 17, 2004; April 7, 2006, April 26, 2006 and so on. Our friendliness and respect towards rock 'n roll in China as well as Dou Wei can be readily seen. When Dou Wei reflected his opinion to us, we were friendly and restrained and we hope to use our good will to relieve Mr. Dou Wei's discontent. Our newspaper deeply regrets this outcome. We reserve the right to pursue legal responsibility for the disruption and property damage that he caused to our newspaper." So what if they gave Dou Wei a high opinion and assessment? So what if they "have made a lot of formidable reports and special features" about rock 'n roll? One thing at a time. Based upon my understanding, Dou Wei did not come over because Beijing News gave him a high opinion and assessment, and it was not for whether Beijing News made a lot of formidable reports and special features about rock 'n roll music. The issue is whether Beijing News was truthful in its report about Dou Wei. Dou Wei said that he did not criticize Li Yapeng and he did not express any dissatisfaction with Li Yapeng. Beijing News offered no explanation about this. Previously, Beijing News had used a statement by Ding Wu's girlfriend to successfully characterize Dou Wei as a mad man. Its role and position are suspect. Beijing News' entertainment section played the card of the "public's right to know" to use the media to wilfully interfere with and disrupt private lives, invade personal space and privacy and use its media tools to create opinions that favor itself. ... According to Dou Wei, this whole began with an uncompleted interview. "This reporter named Tao called me on May 8. He said that he came from Shenyang and he wanted to do a retrospective of Chinese rock 'n roll music over the past two decades. I refused from the very start. The past is not worth remembering and there is nothing good to remember anyway. He called me several more times but I always turned him down. On the last time occasion, I hung up on him. Then he sent me a SMS in which he wrote that he was disappointed, that I was bullshitting him and he will let me remember who he is." At this point, Dou Wei was surprised. "I angrily called him against today. He said that no star ever hangs up on me. If I write this article, then you better pay for my airplane ticket to come to Beijing. You can correspond with our newspaper's lawyer. His voice sounded like that of a little child. I thought that he was a hack, because I never said anything about Li Yapeng." When the reporter asked him if he would settle this matter by legal means, Dou Wei said that anything is possible under heaven. "This is a 'criminal' matter. I gave a knife to you people who are trying to kill me." Obviously, he knows Gu Cheng's poetry much better than he knows the laws. "People are just knives, but it is the people who use these knives who are the most devious." Dou Wei has been using the "conspiracy theory" to explain this whole matter. "I don't want to be suspicious. I can endure all the insults against me. I feel that we are all being threatened. Everything happens by design. You ruin my reputation, and then they get rid of what they don't like. We could not release the recording that we made in 2000. China is a colony for foreign music." Dou Wei's words shows his concern and disappointment with the current music scene. As for his own music and life, Dou Wei thinks that all the musical forms on the market are oriented from the commercial viewpoint. "I hope that we can walk our own path by experimentation. We want to let people listen to our native original works, and not just the Super Girl songs and the noise of fake rock music." "I hope that they will hear a kind of music from which they will know me and my music, and not just as the ex-husband of Faye Wong." The reporter asked Dou Wei, "If you hadn't been married to Faye Wong, would you be more tranquil now?" Dou Wei said calmly that this possibility does not exist anymore, because what happened cannot be avoided. Concerning this matter, the reporter named Tao told the Netease entertainment reporter: "Dou Wei did actually say that. Perhaps he thought that he was having a private chat with me and did not know that I would publish it. Therefore, he said that he did not say that." That reporter said that he was willing to come to Beijing to interview Dou Wei. They spoke over the telephone for about 10 times, and he also has the mobile telephone records as proof. The reporter said: "After the report came out yesterday, Dou Wei even called me up and used foul language to threaten that he was coming to Shenyang to look for me. I am going to sue him for threatening me." Footnote: The reporter named Tao is believed to be entertainment reporter Tao Yi of Huasheng Morning News in Shenyang. He was previously in the national limelight for having lost an address book containing the telephone numbers of 600 or so entertainers. Tao Yi denied through a public statement in his newspaper of being connected to those telephone numbers, and then Beijing Youth Daily published a recorded telephone conversation of Tai Yi personally admitting to having done lost the address book. ... Statement from Dou Wei's lawyers backed by his personal signature: "With the personal approval of Dou Wei, we forwarded Dou Wei's statement about the May 10th incident to the public. 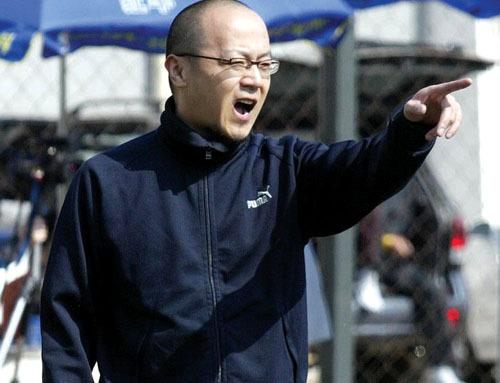 Dou Wei acknowledges that he has disagreements with certain media reports. Since the media were unable to communicate honestly in certain contacts, he employed excessive methods in order to attrack public attention. This is wrong. Dou Wei hopes that when other entertainment people encounters the same situation, they should not imitate his excessive actions." 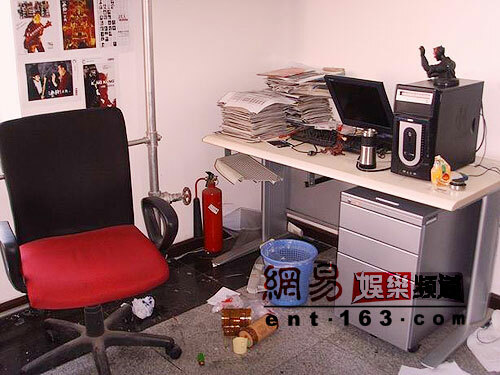 In addition, Dou Wei apologizes for the property damages at the newspaper (including one desktop computer) and on the vehicle. He is willing to assume the compensation for property damage. Meanwhile, the media had been reporting what another famous rock musician Cui Jian is saying. Cui Jian has sent in an official statement to say that much of that is false. "As an artist who was persecuted by the media, Dou Wei used his personal sufferings to ask us to contemplate the relationship among the artists, the public and the media. Under a situation in which the contradictions between the artist and the media cannot be solved, Dou Wei employed an extreme measure. This is unacceptable. But the Dou Wei experience has given us an valuable lesson. Dou Wei went through this in order to beg society and the media to give artists some private space that they should have. He did not evade his personal legal liabilities. After the incident, Dou Wei remained at the scene. He was the person who called the police and cooperatively left with them. In truth, Dou Wei did not cause any threat or harm to any person or organization. When considered in full, his excessive actions should that he was protesting the disrespect by individual media against artists. The law enforcement agnecies need to consider whether Dou Wei should be pronounced guilty." (South China Morning Post) Rocker fades in Faye's shadow. Peter Simpson. May 28, 2006. Former Black Panther lead singer Dou Wei is in danger of being remembered not as one of the founders of rock music in China, but as the out-of-control ex-husband of pop diva Faye Wong. The 36-year-old was recently released from police custody after storming into the Beijing News' editorial department on May 10. He smashed several computers, broke windows and a television set, then set fire to a staff member's car. The troubled rock star having apparently made his not-so-subtle point, then turned himself in to police. His cronies issued warnings of similar actions to an increasingly "nosey" media. Dou was looking for journalist Zhuo Wei, who claimed in two reports that the star was separating from his second wife, Gao Yuan. Zhuo had written that Dou had financial problems, only gave his wife 500 yuan a month, and earned only 250 yuan from gigs. Cynics wondered if Dou's sudden leap back onto the front pages, websites, blogs and TV broadcasts was a carefully choreographed publicity stunt. Media columnists are divided over whether he needs psychiatric help. It is thought most likely though that the man many call the pioneer of Chinese rock simply reached the end of his tether after being abandoned by his public. Many argue Dou had played second fiddle to Faye Wong ever since they were married in 1996. The Dou-Wong saga had it all - tangled love lives, wealth, fame, and, ultimately, heartbreak. They had a daughter, Dou Jingtong, were treated like royalty, had powerful friends, were good looking, talented and adored by millions of fans. Interest in the pair only intensified when they divorced three years after their marriage because of Dou's affair with Gao, his lover before he married Wong. But unlike Wong, Dou, whose trademark in the early '90s was a mane of long hair and the pulsating rhythms of Black Panther, was unable to reinvent himself for a new audience. He started branching out in new artistic directions and no one cared. Signs of his increasing instability came last month. Known for his forthright views, he demanded audiences with reporters and used the interviews to lambaste critics, fellow musicians and anyone else who riled him. However, friends of Dou said he had been perfectly normal the night before the attack on the newspaper. "We had been around him several days before he set fire to the car. He was fine. Dou just wanted to relieve his feelings,'' a friend said. Ma Pei, a musician and friend said "if there was something mentally wrong, he would not have surrendered to the police so calmly". However, Dou's jealousy of his ex-wife's new life was obvious to others. He would have been reading the stories about Wong expecting a baby with her new husband, actor Li Yapeng, and seen photos of the pair hiding behind sunglasses as they were chased across the capital by the paparazzi. In recent times Dou had become a near-recluse, jamming at small Beijing clubs with fellow musicians. "Many contend that he just simply isn't very musically talented any more, and is famous more for being Faye Wong's ex-husband," says Beijing Time Out's music editor, Paul Kendall. "He's been experimenting with jazz acoustics, making formless, lyric-less music. He's been signed by a Hong Kong record label and producing electronic-inspired pieces. But his following is today very small," he added. Dou has been released from custody and will seemingly escape charges of arson and criminal damage. He has agreed to pay compensation to the Beijing News which has said it will not pursue charges - but "will continue to report objectively" the peccadilloes of China's precious celebrities. But Dou has received support from other famous Chinese rockers, including Cui Jian. "The media constantly harasses Dou. His angry outbursts should make people think about the relationship between artists, [the] media and the public," he said, and called for "sound legislation and strong protection of artists' privacy" in the media. Duo has also received support from the public, with most of those voting in online surveys agreeing he deserves another chance. And he's back on the pages of news and glossy magazines in the mainland, and has bloggers hacking away at their keyboards long into the night about "the mad ex-husband of Faye Wong". "What Dou needs most is not money but respect for his private life. If the media do not cover him too much, he will be saved," fellow musician Ma said. China's celebrities are discovering - at some cost - that the trappings of fame are the same the world over. For more discussion on journalistic ethics, see Non-violent Resistance. There is a full page set aside at Sina.com for the Dou Wei versus Beijing News affair, along with a survey. As of 9:00pm May 12, 2006, 9,171 people have taken the survey -- 63% supported Dou Wei, 10% supported Beijing News and 27% supported neither side. See also Reporter Home (Xici Hutong) and NetEase for their special feature pages.